Leading Manufacturer of ultrasonic cleaner and hospital (medical) ultrasonic cleaner from Ahmedabad. STERI TECHNO FAB is one stop solution offering ultrasonic products. An ultrasonicator works on the principal of ultrasound frequency (usually 20-40 KHz). Here Electrical energy is converted into ultrasound waves by means of ultrasonic transducers. 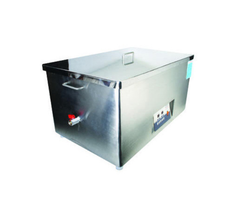 Ultrasonic Cleaner is based on cavitation effect caused by high frequency ultrasonic wave vibration signal in fluid. Microscopic bubbles formed and they implore violently that cause cavitation, which gives out great impact to the cleaning subject and provides an intense scrubbing action on the surface of cleaning subject. Additionally, the bubbles are small enough to penetrate even microscopic crevices, cleaning them thoroughly and consistently. * Electronics Industry for delicate parts. * Hospitals & Medical Industry. * Jewelry Industry for intricate parts. * Auto Industry for rugged parts. * Dental Clinic & Laboratories. * Ultrasonic bath is designed with MOSFET/ IGBT & the latest micro controller base technology. * Auto tuning with overload protection arrangement. * Imported transducers are used in our Ultrasonic Cleaner (Ultrasonic bath). * Operating frequency of 23 / 33 KHz. Variable frequency on demand. * Digital tuning & Thermo dynamic design to ensure long life of generator. Packaging Details: IT COMES WITH STANDARD PACKING AS WELL AS IN WOODEN PACKING*. 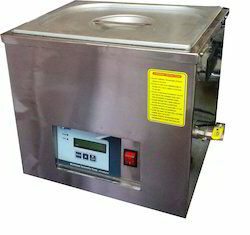 Looking for Ultrasonic Cleaner ?